We’re delighted to announce that Metaverse Ink’s OpenSearch has been selected as the default interface for search in the new viewer realXtend, whose 0.2 release was announced today. The realXtend project has been working closely with OpenSim in order to add some major features to it, both in terms of graphics and in terms of the underlying architecture of virtual worlds. The most important addition is the idea of an “avatar system”, a piece of the architecture that sees avatars as entities that can move freely between worlds — not just sims on the same grid, but sims on different grids. An avatar has an identity and an inventory, and that’s what’s being served from that component. The avatars themselves can now be created with a standard 3D modeling tool. 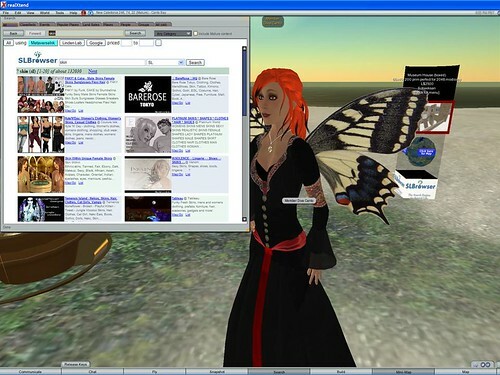 We believe that OpenSim, with these realXtend additions and other additions that are already in the making, is the future of interoperable virtual worlds. We are excited to be a part of it! So, download realXtend, and try it out. Don’t forget to click the Search button and see OpenSearch natively served. Now you have a choice on the search engine you use for each search, just like what happens in modern web browsers. Published by Diva Canto, in news. Tagged with OpenSearch, OpenSim, realXtend.